CALLING ALL TRICK-OR-TREATERS! IT’S SCARY HOW MUCH GOOD YOU CAN DO! Actress, platinum recording artist and author Zendaya, this year’s Trick-or-Treat for UNICEF spokesperson, is asking kids in the U.S. to make a difference in the lives of other kids by raising funds for UNICEF’s lifesaving programs. Zendaya will be appearing as a “Trick-or-Treat for UNICEF superhero” in print, online, and broadcast public service announcements to encourage participation in the 64-year-old American tradition. Donations collected through Trick-or-Treat for UNICEF provide medicine, nutrition, clean water, emergency relief and education to children around the world. The campaign relies not only on children and parents, but also on educators to teach their students the value of helping kids in need. This year K-8 teachers can participate through the 2nd annual Trick-or-Treat for UNICEF School Challenge. The competition will provide 15 grand prize winning teachers with $1,000 technology grants. All entrants will be asked to describe how they will teach their students about issues facing children globally and the importance of giving back. To be eligible to win, teachers must submit Trick-or-Treat donations by Dec. 1, 2014. To enter the competition, visit www.trickortreatforunicef.org. For the first time in its 64 year history, kids and parents can go digital by fundraising through Crowdrise in support of the campaign and in just a few seconds, can set up a Trick-or-Treat for UNICEF fundraising page to share with friends and family. The money raised will help save and protect children by providing clean water, nutritious food, lifesaving vaccines and more ($1 can provide a child with 40 days of clean, safe drinking water; $5 can bring a hungry child back to health; $10 can give 280 children lifesaving vaccinations)! Additionally, this year’s Trick-or-Treat for UNICEF Teachers’ Guides can be used as a resource for educators to help provide students with the knowledge and skills needed to make an impact through the campaign. Using readings, photos, videos, music, maps, and games, they introduce students to UNICEF’s work, child rights, and a variety of issues affecting the health and well-being of children around the world. This Halloween, you have the power to save kids’ lives. In just a few seconds, you can set up a Trick-or-Treat for UNICEF fundraising page to share with friends and family. The money you raise will help save and protect children by providing clean water, nutritious food, lifesaving vaccines and more. Because some kids need more than candy. 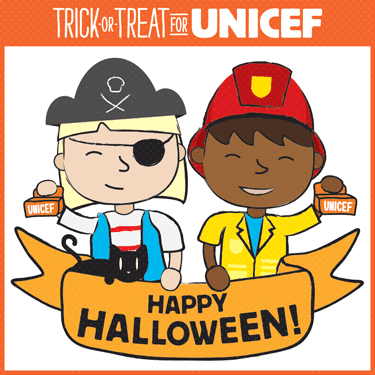 If you would like to Trick-or-Treat for UNICEF you can now place your request for a your FREE Unicef 2014 Trick or Treat Kit. Spread the word to family and friends. Let’s Trick-or-Treat for UNICEF!